Ingeteam is a market leader specialising in the development of electrical equipment, such as motors and frequency converters. The company primarily serves sectors such as energy, mining, industry, marine, and rail traction, seeking to optimise energy consumption while maximising generating efficiency. Its mission is to develop in-house products that provide custom solutions, adapting to each client, application and sector in which they operate. Ingeteam’s mining sector is set to become a global supplier of comprehensive product solutions for mining applications, featuring state-of-the-art power electronics and machines designed and manufactured with in-house technology to develop a complete electrical drive package. Ingeteam’s business model in the mining market offers everything from a single frequency converter to a complete drive train package, with rectifier transformers, frequency converters and motors with corresponding accessories. 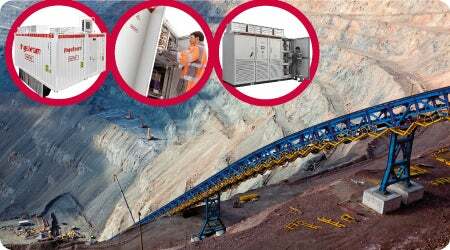 In the industrial-mining sector, Ingeteam offers a wide variety of solutions for mining and mineral processing, developing applications both for new installations as well as for the refurbishment and expansion of existing ones, and attending to the complete production process, from extracting material and processing it to transporting and delivering it. Ingeteam offers prefabricated, modular power control room housing, complete power distribution and control cabinets, as well as auxiliary systems such as heating, ventilation and air conditioning; dust filter pressurisation; fire protection; and access control. Services from Ingeteam include its 360º CRS programme. Telephone availability of an engineer during office working time. This support service provides immediate phone access on a 24 hour / 365 days basis to a specialised engineer with problem-solving capabilities. Specific specialist for customers training courses at Ingeteam. Investment in professional training improves productivity. Skilled Ingeteam engineers will be ready to support customer physically on-site, at request, for troubleshooting and technical assistance. Converters design life for 20 years. The supply consists of phases II and III of what is to be largest concentrated solar power complex in the world which, once completed in 2018, will produce over 560MW of solar energy. In February 2015, Ingeteam was awarded a contract by Zitrón for the electrical equipment for a mine hoist in Bolivia. The order comprised the main electrical package, including the main circuit breaker, rectifier transformer, frequencey converter, as well as related engineering and on-site services. INGEDRIVE® is the family of low and medium-voltage frequency converters designed and manufactured by Ingeteam. The MV500 series of the INGEDRIVE converter range is composed of medium-voltage, IGBT-based, frequency converters. They are designed to control induction, synchronous or permanent magnet motors in a wide range of industrial and marine applications. Its modular design makes it possible to encompass a wide range of powers and voltages while its intuitive structure facilitates its use and maintenance. The MV700 series of the INGEDRIVE converter range is composed of a medium-voltage, IGBT-based, frequency converter. The MV100 series of the INGEDRIVE converter range is composed of medium-voltage, IGBT-based, frequency converters. They are designed to control induction, synchronous or permanent magnet motors in a wide range of industrial and marine applications. Its modular design makes it possible to encompass a wide range of powers and voltages, while its intuitive structure facilitates its use and maintenance. Ingeteam is a market leader specialising in developing of electrical equipment, motors, generators, frequency converters, electrical engineering and generation plants. The company serves four key sectors: energy, industry, marine and rail traction. In September 2011, the company Outotec, located in Espoo (Finland), awarded Ingeteam a contract for the design and supply of the main drive equipment for a 2.3MW SAG mill and a 2.1MW ball mill to be installed in Russia. Outotec is a global leading company that designs and delivers turnkey projects in the mining industry, as well as being one of the largest mechanical suppliers of grinding mills worldwide. In April 2012, the Chinese company Shanghai Hualing awarded Ingeteam a contract for the design and supply of the main frequency converter for a mine hoist to be installed in Tongting, Anhui province, China. Ingeteam SpA (Chile) has announced the appointment of Mr Claudio Álvarez M, mining engineer and industrial civil engineer, as the business development manager of industrial and marine drives. Claudio has over 15 years experience in the mining sector after working in different companies in this sector, the last being Howden Chile, where he was responsible for opening its sales office. Hoist and Haul are the leading conferences in the worldwide mining sector in terms of hoisting and hauling. In February, Ingeteam was awarded a contract by ZITRON for the frequency converter equipment for a mine hoist in Bolivia.